You'll be £25.00 closer to your next £10.00 credit when you purchase RAF and the SOE. What's this? The Special Operations Executive developed a vast network of agents across Occupied Europe which played a vital role in developing and sustaining Resistance movements that persistently sought to subvert German control of their territories. The culmination of their efforts was seen when the Allied armies landed at Normandy in June 1944, with the SOE and the Resistance causing widespread destruction and disruption behind the German lines. None of this would have been possible had it not been for the Royal Air Force. Not only the RAF supply the SOE, and the movements it led and co-ordinated, with the thousands of tons of arms and equipment needed to undertake this role, it also delivered and retrieved agents from under the very noses of the enemy. Compiled at the end of the war by the Air Historical Branch of the RAF, this is an extremely detailed and comprehensive account of the RAF’s support for the SOE, and in it we learn of the enormous and complex arrangements undertaken by the Special Duties squadrons as well as showing how the material delivered by these aircraft was used in the field. 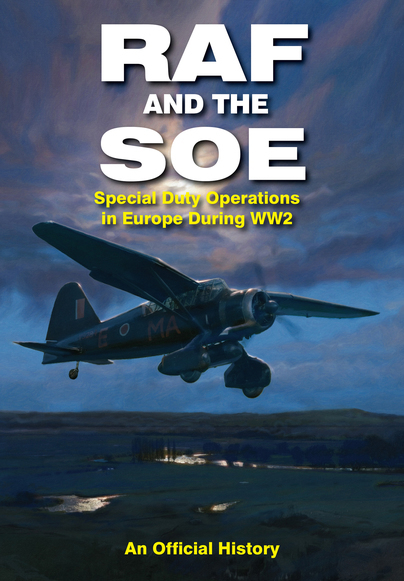 Overall this is a valuable work for anyone interested in SOE, providing a detailed examination of the work that went into the difficult task of supporting SOE’s operations, and this more than makes up for the lack of readability in some sections. The Special Operations Executive (SOE) was established after the German occupation of mainland Europe in a bid to 'set Europe ablaze', as Winston Churchill memorably put it. The key enabler to allow the SOE to function and be supported deep in the enemy held territory was the RAF, and specifically its Special Duties squadrons. Accounts of Westland Lysanders landing quietly at night on unlit fields in France, dropping off or picking up agents, are well documented. Less well known are the efforts of the Armstrong Whitworth Whitley and Handley Page Halifax crews who would parachute stores and ages into hostile territory. The latter, undeniably brave, often met a gruesome fate. This book brings the official records relating to these operations into a collective form for the first time. The compilers should be congratulated on this worthy achievement. While not necessarily bedtime reading, this publication will be a valuable addition to anyone with an interest in RAF history or the SOE. Thoroughly recommended. A fascinating look at the Special Operations Executive and for sure one for the library of any researcher. It would have been better had an index been included at the rear of the book. Many authors send us their publications for review, sadly this was not the case with this one but nonetheless we will review it on our website and recommend it. Delivers a remarkable account of the way in which the RAF and the SOE worked together to place operatives in key places in Europe during the second phase of the second world war. I will never tire of reading about the exploits of these amazing people who changed the tide of the war. Based on AIR 20/8459, this is an Official History that provides the most accurate and detailed review of RAF/SOE operations during WWII. This is a fascinating review that reads well and contains rare images in its photo-plate section – a very worthwhile book opening up a previously obscured period of history.